Our Guild has a "Strange Paper" galleria coming up at Monday's meeting... I love Bee Paper Bogus Recycled Sketch Paper. It's this nice brown shade and has a rough'ish texture good for pastels and colored pencils, and I was in a mood to create some gems... This is the result. I'm very pleased with it. Love those gems BIG GRIN. The lettering is a double dipping with Sumi ink technique. 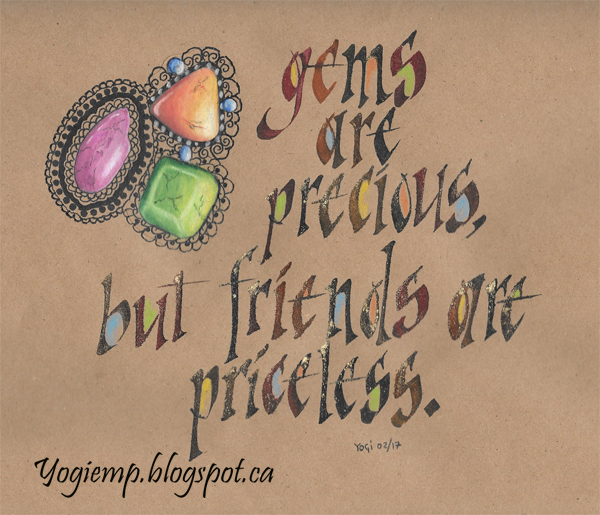 Seriously, your gems look completely real. Wow!